Hello, my name is Anatole Konstantin. You can click here and here to read my previous AMAs about growing up under Stalin, what life was like fleeing from the Communists, and coming to America as an immigrant. After the killing of my father and my escape from the U.S.S.R. I am here to bear witness to the cruelties perpetrated in the name of the Communist ideology. 2017 marks the 100th anniversary of the Communist Revolution in Russia. My latest book, "A Brief History of Communism: The Rise and Fall of the Soviet Empire" is the story of the men who believed they knew how to create an ideal world, and in its name did not hesitate to sacrifice millions of innocent lives. The President of Russia, Vladimir Putin, has said that the demise of the Soviet Empire in 1991 was the greatest tragedy of the twentieth century. My book aims to show that the greatest tragedy of the century was the creation of this Empire in 1917. My grandson, Miles, is typing my replies for me. Visit my website anatolekonstantin.com to learn more about my story and my books. Update (4:22pm Eastern): Thank you for your insightful questions. You can read more about my time in the Soviet Union in my first book, "A Red Boyhood: Growing Up Under Stalin", and you can read about my experience as an immigrant in my second book, "Through the Eyes of an Immigrant". My latest book, "A Brief History of Communism: The Rise and Fall of the Soviet Empire", is available from Amazon. I hope to get a chance to answer more of your questions in the future. Amazing work, is there a particular reason or spark that got you into chalk art specifically? What was the status (class) of your dad before the October revolution? What were the contents of the messages he sent to people on the outside? I went to art high school and college (Savannah College of Art and Design). There was a sidewalk chalk festival in my hometown (Savannah, GA) and I started when I was 17. After I went to college I kept doing the festival and really enjoyed the medium and temporary nature of the art form. I was commissioned by some local businesses to create chalk art for events. I then applied to a larger festival, Marietta Chalktoberfest in 2013. There were out of state artists there. I learned that there is a whole group of chalk artists that follow a circuit of festivals across the US and Europe. I have been doing it ever since! My father was a photographer which would be middle class. The messages he sent to his parents were about his wife and children - the usual stuff discussed between parents and children. He was never involved in politics which meant that he was not a member of the Communist Party. As a history student, I've learned that there's many different explanations to why the Soviet union eventually collapsed. Whilst they probably all contributed, which do you find was the most decisive? Oh I will have to check it out!! I think it was the spiritual crisis caused by discrepancy between the rosy propaganda and totalitarian reality that made the Soviet people lose faith in the system. I think there is a lesson in this for us. Hi Anatole, thanks for taking the time to do this AMA. What would you say surprised you most about American culture when you came here, vs. what you had heard while you were in the USSR? The Soviet propaganda painted the United States as an almost fascist country where everyone was being exploited by the capitalists and wished they lived in a Communist country. One couldn't read Western newspapers or books and did not have any information about real life in the West. The fact that no information was available from the West did not give us an opportunity to compare the two systems. I did not believe them and, having studied in West Germany after fleeing the Soviet Union, already knew what democracy was all about. What's a recipe you recommend? How prevalent was petty theft in day to day life growing up within the Soviet Union. Not necessarily stealing from each other, but trying to steal from the regime? Did people often steal from each other, or was there more of a group mentality, of we're all in this together? Was there an element of needing to steal to survive, or live in otherwise unbearable conditions? Any information or perspectives you could give on the world of petty crimes would be interesting to me. I love making Wookie Cookies from my Star Wars cookbook. Also, I love making cupcakes like they make them at Back in the Day bakery in Savannah, GA. They're the best. It depends on how you define "petty crimes". During the collectivization of farmers, theft from the collective farm of a handful of grain stalks needed for survival was considered a crime punishable by years of imprisonment. People stole because there were shortages of everything and among the population, stealing from the government was not viewed as a real crime. In general, petty crime was common. Edit: People had to remove windshield wipers when they parked their cars for fear of them being stolen. I love your art!! The colors are so vivid! Do you use the kind of sidewalk chalk you would find at Walmart or Toys R Us or is there a high quality brand of chalk for experts? What is the biggest challenge in making a piece of art like this? Do you create art in any other medium or chalk only? What is your favorite book from that giant shelf behind you in that picture? The chalk from Walmart works just as well as any other chalk. The important thing to make your work stand out is to try to have good contrast between your colors that you're using. That said, there are a few brands that stand out as great to have to use alongside the crayola and playdoh chalks from Walmart. Chalk pastels are great for adding more color and you can get the cheap sets from Michaels. I also use a few professional grade brands to chalk my murals which includes pastels from Mount Vision and Eternity Arts. I also like to do pastel on paper and paint at home. I love your work. What's your next goal? How do you think things would have turned out if Trotsky had been able to succeed Lennin instead if Stalin rising to power? what are some things that outsiders would not necessarily know? What would be your ideal method of governance? It's a lot of fun and really easy to get started doing. My husband wasn't doing any art before he became my helper and now he chalks on his own. Anatole, what do you see is the most ideal and fair system of government, and which countries have implemented that system of government the most faithfully? I use many different brands for different reasons. Cheap sidewalk chalk/crayola: I use dollar store chalk for lighter skin tones, background and covering big areas. Eternity Arts: Large sticks are $1.25 each. They are large and buttery. They are really great for big faces. I love the white as a base. Mount Vision Pastels : This one is chalk gold. $3 a stick and goes really far. It really rubs on like makeup. I think it is democracy in which the opponents are not considered to be enemies, as we had it in the second half of the 20th century. What do you think of Putin and his role in Syria? According to rumors, Stalin was assassinated by Lavrenty Beria who arranged for a larger than normal dose of blood thinning medication be given to him. Beria felt his life was threatened when Stalin was preparing another purge of the leadership. I am not an expert in matters of the war. As for the book question, my new book "A Brief History of Communism" analyzes life in Communist Russia. What if any parallels do you see in Putin's increasingly autocratic government and the Soviet government? The fact that he is approved by 80% of the Russian population shows that because Russia never had a real democracy, an autocratic government is acceptable to a majority there and so is Putin's objective of restoring military power and influence in the world. Russia has never survived under a “democracy.” Without an authoritarian leader like Vladimir Putin, Russia would cease to exist and would split into several impoverished republics. It’s a nation that needs strong federal unified rule. I’ve studied this subject for several years and I’ve written multiple papers about it. It’s evident in Russia’s history. The stark demographic and cultural differences that exist among her people makes the principle of “democracy” nearly impossible to implement and sustain. This is an accurate representation of the state of Russia. What party/ideology do you identify with in the US? What do you think about Bernie Sanders being painted as a communist for wanting to incorporate socialistic programs into our capitalist society? I am in the middle of the road between the republicans and democrats. We should differentiate between Communism and Socialism. 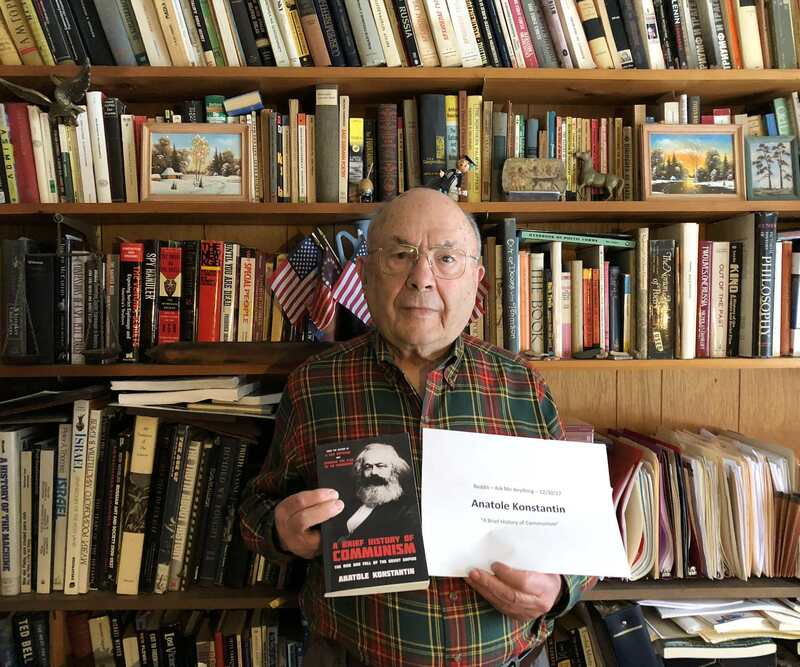 Bernie Sanders is not a Communist. I think he would like to see a system more like what they have in Sweden, which is a monolithic society and would not work here. As a survivor of Stalin's regime, what would you say to demonstrate how bad it really was to someone who's romanticizing the communist ideology? Stalin's regime caused the death of over 24,000,000 of his citizens. They killed my father and many others just for writing a letter to their family abroad. They starved millions of people during artificially created famines in order to force farmers into collective farms. I would recommend reading "Gulag: A History" by Anne Applebaum. Do you think that the hardships you endured are related to an inherent evil in Communism? Or is it that the people in power were corrupt? What I mean is, do you think in a perfect world Communism would work and the problem is we are imperfect creatures, or is Communism evil even if it is implemented perfectly? Considering that the same system in other countries like China, Cuba, and Cambodia led to the same results, it shows that it was the system that is incompatible with human nature. It couldn't be implemented in any other way. Powerful people in other ideologies are also corrupt and yet they did not murder millions of their own citizens. What is your opinion on educated people in America who openly support communism, as well as dictators and their dictatorship? As the son of a Cuban whose family was prosecuted and killed in Cuba, it infuriates me to hear people who praise those like Castro. So many people see only what they want to see. Edit: after some responses and questions I went to talk to my father about the family history. Turns out my direct family (grandfather, pregnant grandmother) left Cuba because my grandfather, a doctor, helped both Batista's men and the men they were fighting during a shootout. Batista put 500,000$ on my grandfather's head for aiding the others. They also disagreed with Batista and later Castro, who ran the rest of my family out of Cuba. My father said to relay a few things, first that Batista was bad, no denying that, but Castro was worse in his opinion. Batista was a murderer, but he mostly just messed with the political class and left the rest alone if they didn't interfere with the money. Castro messed with everyone, and ran the country into the ground. My grandfather, Maximo/Luly Viera, was smuggled out, while his cousin Mingolo was not. Mingolo was on Batista's bad side, so he was caught, shot 150 times, and thrown on his mother's front porch. Edit 2: My father said to post, if communism was so good they wouldn't need fences and walls and machine guns to keep people in. I think these people are not sufficiently educated because schools are not doing a good job teaching history. I wish history teachers themselves knew more about what went on. Those who don't know the past are liable to repeat it. Are you still speaking at local schools on life in the USSR? Do you have comments from speaking with students/teachers on your life? You comment on how education does not sufficiently emphasize lessons from history, and I think hearing and seeing someone speak, or writing personal accounts, will likely always be a lesson that finds more connection than watching an aged documentary or reading from a dry school textbook. Apart from writing, do you have other hobbies? Do you think communist or other harsh political ideologies would be harder or easier to find root today compared to the early 20th century? Thank you - best of luck to you and your family in your business and personal endeavors! I am no longer speaking in schools, but I am still being interviewed occasionally in local libraries. I found that most history teachers I met are not knowledgable about Communism and therefore their students are not familiar with it. As for hobbies, I try to follow scientific developments in all areas. I think that with jobs being lost to automation and artificial intelligence it may become easier in the future for these ideologies to take root. Is it communism or dictatorship and lack of free speech that made life under Stalin so bad? Can you have a democratic communist country with free speech? A Communist system cannot tolerate another political party or ideology. Therefore, perhaps only after they exterminate all of their opponents, they would accept "free speech" from their supporters. Do you think Troksky would have been able to bring about a more wholesome, successful, and supportive form of socialism than Lenin did? Since Trotsky wrote, "The Red Terror is a weapon used against a class that, despite being doomed to destruction, does not wish to perish," I do not think that his rule would be any more benevolent than Lenin's. What do you feel about the current state of the American hard left? And the polarization of the political landscape in general? I think that the hard left is balanced by the hard right and neither are compatible with democracy as we know it. This is the most polarized time in our history and I think this too shall pass. Thank you so much for taking the time to do this! Your insights are fascinating and I'm definitely hoping to pick up your book soon! Do you think there are any artistic/fictional representations of life under Stalin's regime that have a particular resonance with your experiences? Yes, there is a Russian movie with english subtitles that is called "Burnt by the Sun" which is available on Amazon. How do you feel about all the memes and jokes about Stalin, Hitler, and communism in general? Are they offensive? I am not familiar with memes, but I do not find these sorts of jokes offensive.